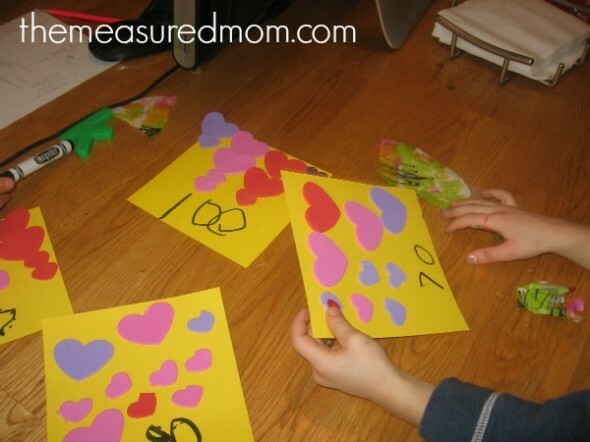 I remember a first grade student of mine who could count by tens just like her classmates. But if I gave her a pile of counters and asked her to group them and count by 10’s, she would take three little counters and count as she moved each piece: “10, 20, 30.” I looked at her tiny pile of three and asked, “How many do you have?” “Thirty,” was her reply. We did a lot of this kind of thing until it finally clicked with her that items had to be in groups before she could skip count. 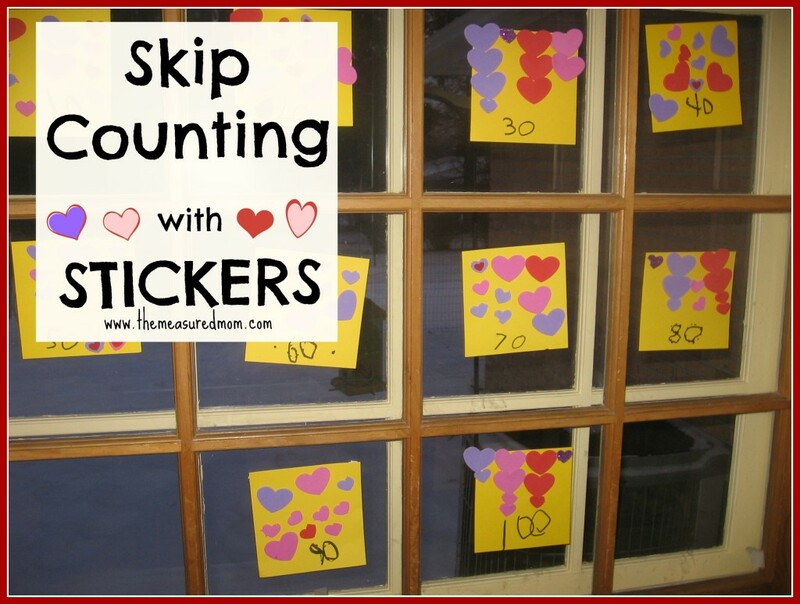 I remembered that as I planned a way to teach skip counting to my Four. We took out our supply of foam heart stickers. Because everything is more fun with stickers. It’s also a sure way that I will get all of my kids to abandon their toys in the playroom and join me for some math. I’d prepared 10 yellow squares. 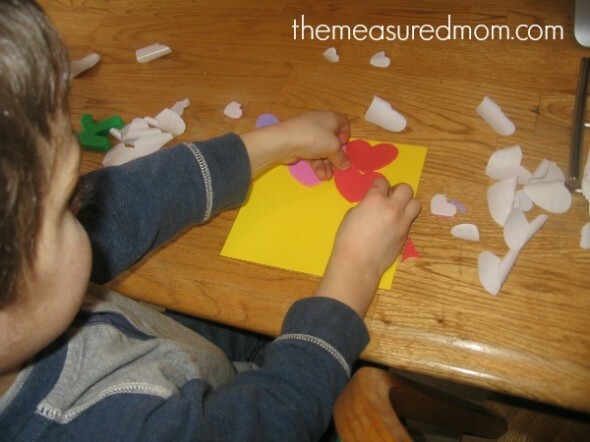 The kids worked to stick 10 foam hearts to each square. My Two (above) can count to 10, but he can’t count items to 10. Still, he enjoyed putting the stickers on the squares, and I counted each of his sets with him as he completed them. All the kids remembered to leave a little space at the bottom of each square for us to write in. 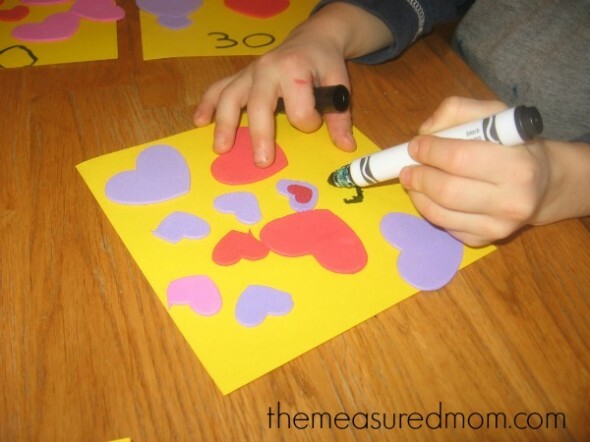 When we had 10 squares with 10 stickers each, my Four and Five took turns writing a number on each card. My Five, who has very good number sense, led the way. My Four was taking it all in. After we’d labeled each card and read through them a couple of times, I asked my Four for each number by turn. 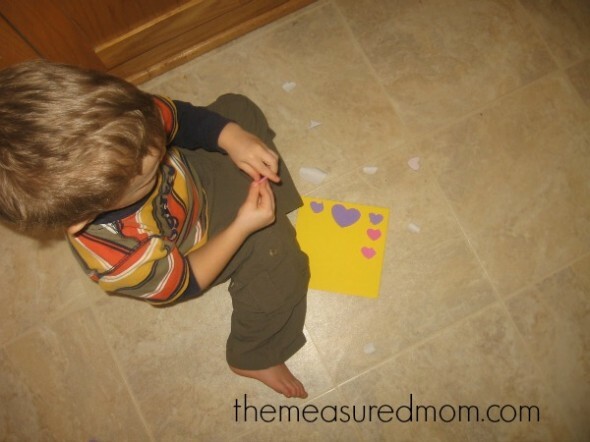 This was good practice for him in recognizing these larger numbers. 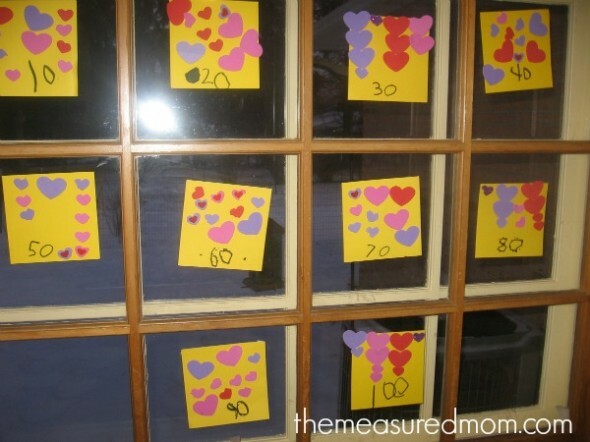 My Five taped each set of hearts to our kitchen window. Having this display close to our dinner table provides a lot of opportunity for review. Need more math ideas? Click on the link below! Neat idea! I should do this with train stickers with my son. 🙂 Pinning this to my Preschool Math board! I’d love to know how it works out! 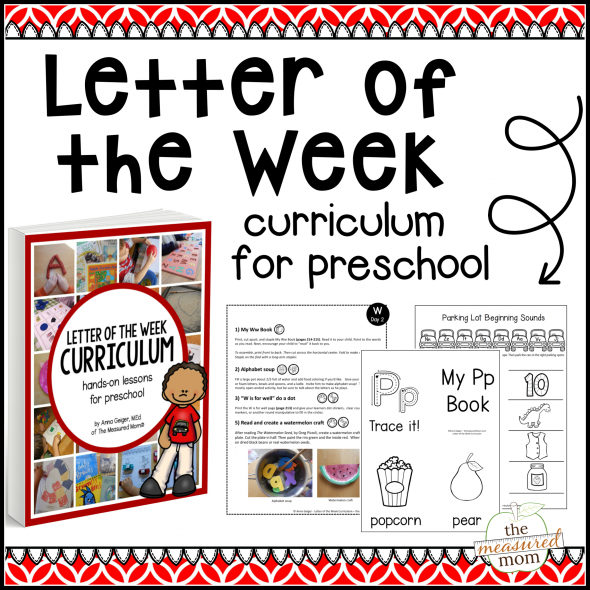 I did this activity with my 4 year old, and I wanted to tell you how great it was! It took us quite a while to get ten sheets of ten stickers finished. We both did sheets, but she tired of it quickly. It took weeks because we’d put it aside when she got tired, but then I’d forget about it. When we finally got ten sheets of ten stickers, and I had her write the numbers on each sheet, it was like a light bulb turned on in her brain! She got why we had been doing this! I paired it with a counting to ten song on youtube, and that really helped to have the tactile, visual, and auditory. She is so proud of herself, and I’m a proud mama! Thanks for this great idea! This post is kind of buried in the beginning days of my blog, so I’m thrilled you found it, Anne! No surprise it took days to complete this one – it’s a big job (it helps when I have a few kids to work together on it :). Good for you for coming back to it, and so great that it all “clicked”! I love how you made it multi-sensory. Thanks so much for writing!